TACCIA Tanto Shirasaya LE (Wood) Tanto is a traditional Japanese short sword used by samurai as a self-defense, close-combat weapon. As Japanese swords evolved, the tanto grew to become a charm for protection against evil and misfortune. In ancient Japanese Samurai culture, the Tanto blade was often housed in both a ceremonial and a protectant housing. The Shirasaya wooden scabbard, made of Magnolia wood, was the actual housing used to store and treat the metal of the blade, protecting it from moisture, and thus corrosion, due to the lacquer and chemicals in its decrotaive mount. The Taccia Tanto Shirasaya LE is made of Magnolia wood, and is hand crafted with a clear lacquer, providing for a protective outer coating onto its distinctive barrel design. Each barrel cap is embellished with a mekugi mark- similar to actual katana sword pin designations. Tanto Shirasaya LE pens feature an ultra-unique metal neck sleeve- that can be easily screwed onto each barrel grip section- designed as add-on part for the optional use and desired comfort level of each writer. 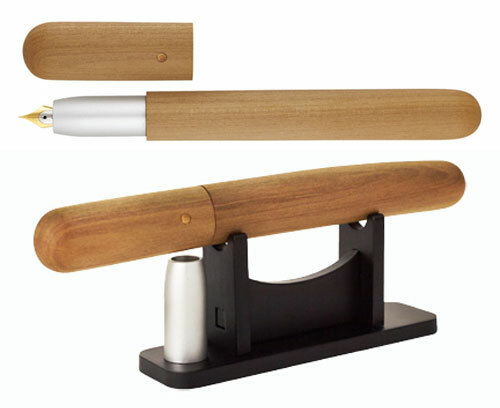 This collection is limited to 25 pieces worldwide, features a 14K gold Japanese nib and is delivered with a pen stand. TACCIA Tanto Wajima Urushi LE Featuring the World Famous Wajima Urushi: a Classic Masterpiece! Tanto is a traditional Japanese short sword used by samurai as a self-defense, close- combat weapon. As Japanese swords evolved, the tanto grew to become a charm for protection against evil and misfortune. 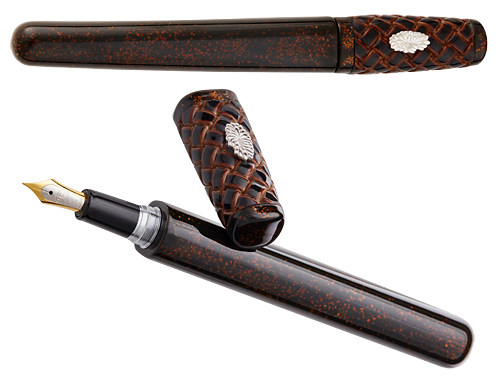 This time-honored Taccia Tanto Wajima Urushi LE fountain pen pays homage to the Wajima region of Japan. World renowned for its unique Urushi and Maki-e techniques that date back to the 14th Century, Wajima Urushi utilizes a special layer of cloth to the urushi lacquer, which strengthens the barrel. Each Tanto Wajima Urushi LE pen barrel is beautifully hand crafted and hand- buffed by a top artisan from Wajima. The barrel design- an artisitic balance between crimson and black- calls forth a peace and calm, reflective of the culture and geography of Wajima. 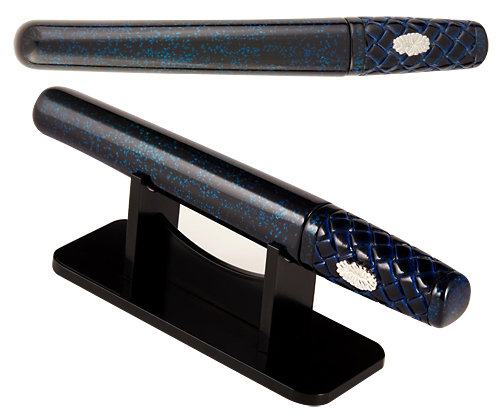 Tanto Wajima Urushi LE pens feature an ultra-unique metal neck sleeve- that can be easily screwed onto each barrel grip section- designed as an add-on part for the optional use and desired comfort level of each writer. This collection is limited to 25 pieces worldwide, features a 14K gold Japanese nib and is delivered with a pen stand. The Taccia Reserve Maki-e Autumn's Brushes Limited Edition fountain pen is made from hand-crafted ebonite hard rubber and Urushi lacquer, and decorated with raden and gold powder. It is available with your choice of 18kt gold nib in Soft Fine, Soft Medium, or Soft Broad. Ebonite is a classic material for quality writing instruments, and the Autumn's Brushes fountain pen has an ebonite barrel which is coated with over 40 layers of Urushi lacquer. The motif, conveying the warmth of autumn and reminiscent of crunchy fall leaves, is created using raden and gold powder sprinkled throughout. Cartridge/converter fill with converter included. A worldwide edition of 50 fountain pens. Ebonite is a classic material for quality writing instruments, and the Autumn's Leaves fountain pen has an ebonite barrel which is coated with over 40 layers of Urushi lacquer,and decorated with raden and gold powder. It is available with your choice of 18kt gold nib in Soft Fine, Soft Medium, or Soft Broad. Though the motif remains abstract, it conveys a sense of falling leaves using raden and gold powder sprinkled throughout. Warm burgundy, gold, and brown envelop a backdrop of forest green and black as the entire pen seems to come to life. The striking leaves pattern continues even on the gripping section, demonstrating Taccia's excellent attention to detail. With many layers of Urushi lacquer, the finish and section are exceptionally smooth to the touch. Cartridge/converter fill with converter included. A worldwide edition of 50 fountain pens. The Taccia Reserve Maki-e Autumn's Rustle Limited Edition fountain pen is made from hand-crafted ebonite hard rubber and Urushi lacquer, and decorated with raden and gold powder. It is available with your choice of 18kt gold nib in Soft Fine, Soft Medium, or Soft Broad. Radiating warmth in shades of caramel, auburn, and brown, the Taccia Reserve Maki-e Autumn's Rustle Limited Edition fountain pen embodies the understated beauty of the fall season. The Taccia Reserve collection demonstrates the finest in Maki-e artwork, taking writing instruments to new levels. Ebonite is a classic material for quality writing instruments, and the Autumn's Rustle fountain pen has an ebonite barrel which is coated with over 40 layers of Urushi lacquer. Pieces of abalone are inlaid on the surface before the lacquering, adding depth and color to this amber-hued stunner. Cartridge/converter fill with converter included. A worldwide edition of 50 fountain pens. The Taccia Reserve Maki-e Winter's Breath Limited Edition fountain pen is made from hand-crafted ebonite hard rubber and Urushi lacquer, and decorated with raden and eggshell. It is available with your choice of 18kt gold rhodium-plated nib in Soft Fine, Soft Medium, or Soft Broad. With its vivid raden stripes and textured eggshell motif, the Taccia Reserve Maki-e Winter's Breath embodies the winter season with elegance. The Taccia Reserve collection demonstrates the finest in Maki-e artwork, taking writing instruments to new levels. Ebonite is a classic material for quality writing instruments, and the Winter's Breath fountain pen has an ebonite barrel which is coated with over 40 layers of Urushi lacquer. Pieces of abalone are inlaid on the surface before the lacquering in a stripe motif, while bits of eggshell are carefully placed to form a symbol of the refreshing winter air. Cartridge/converter fill with converter included. A worldwide edition of 50 fountain pens. The Taccia Reserve Maki-e Winter's Crystals Limited Edition fountain pen is made from hand-crafted ebonite hard rubber and Urushi lacquer, and decorated with raden. It is available with your choice of an 18kt gold, rhodium-plated nib in Soft Fine, Soft Medium, or Soft Broad. Inspired by the freshness of the winter season, Taccia's Reserve Maki-e Winter's Crystals fountain pen is a composition of snowfall reimagined. The Taccia Reserve collection demonstrates the finest in Maki-e artwork, taking writing instruments to new levels. Ebonite is a classic material for quality writing instruments, and the Winter's Crystals fountain pen has an ebonite barrel which is coated with over 40 layers of Urushi lacquer. Pieces of abalone are inlaid on the surface before the lacquering, forming a colorful swirl of abstract snowflakes. The contrast between the stark black finish and the elegant raden crystals is striking. The Tanto Limited Edition pays homage to the Japanese samurai, who served men of royalty and nobility in historical Japanese culture. A *tanto* is a traditional Japanese short sword, used mainly as protection for self-defense and close-quarters combat. As Japanese swords evolved, the tanto grew to become a charm for protection against evil and misfortune. The Tanto Limited Edition builds on this reputation, physically embodying the elements of a traditional tanto sword with a hand-polished ebonite barrel, coated with fine Japanese Urushi lacquer. The method of Hirame-ji Urushi, used in this instrument, is an extremely deliberate and detailed technique. Gold, silver, or other materials such as sea shells are ground into powder form, sprinkled onto a surface, sealed with Urushi lacquer, and hand-polished. This procedure is repeated numerous times by Japanese craftsmen to bring depth and clarity to each barrel. Each individual barrel requires many hours of individual attention. Among the many symbols of nature and life, two of the most important and celebrated in human culture are the elements of Water and Wood. Guided by these celebrated symbols, Taccia*s Japanese craftsmen created deepwater indigo and earthy auburn designs, and breathed life into each pen with a shimmering coat of Hirame-ji. Each TACCIA Tanto Hirame-ji is completed with a calfskin leather-wrapped cap and sterling silver *Manuki* pin. Each Limited Edition fountain pen comes with a Japanese 14-karat, two-tone gold nib, and includes a presentation stand worthy of its Tanto legacy. Available in Water or Wood, the Tanto Hirame-ji is limited to 30 pieces in each finish worldwide. Taccia proudly introduces the Tanto LE Collection, in honor of the Japanese samurai who served as men of royalty, dignity, righteousness, diligence, along with justice and noble responsibility. A �tanto� is a traditional Japanese short sword used by samurai as a self-defense, close-combat weapon. As Japanese swords evolved, the tanto grew to become a charm for protection against evil and misfortune. The Tanto is hand-polished from an ebonite barrel and coated with fine Japanese Urushi lacquer. Beautifully fitted with a sting ray leather cap, sterling silver sword pin ornament and Japanese 14kt gold nib and rhodium plated. Cartridge/converter fill. Available in Moonlit Black and Crimson Red, the Tanto fountain pen is limited to 100 pieces worldwide. Taccia proudly introduces the Tanto LE Collection, in honor of the Japanese samurai who served as men of royalty, dignity, righteousness, diligence, along with justice and noble responsibility. A �tanto� is a traditional Japanese short sword used by samurai as a self-defense, close-combat weapon. As Japanese swords evolved, the tanto grew to become a charm for protection against evil and misfortune. The Tanto is hand-polished from an ebonite barrel and coated with fine Japanese Urushi lacquer. Beautifully fitted with a sting ray leather cap, sterling silver sword pin ornament and Japanese 14kt gold with rhodium plated medium nib. Cartridge/converter fill. Available in Moonlit Black and Crimson Red, the Tanto fountain pen is limited to 100 pieces worldwide. Throughout history, Jade has been viewed as a symbol of nobility, beauty, wealth, and good fortune. With records showing the prized ceremonial stone mined as far back as 6000 B.C., premium-grade Jade is now valued higher than gold and platinum, priced at over $3,000 per ounce! Taccia is renowned for its attention to quality, craftsmanship and unique, collectible designs. The Emperor Maki-e Limited Edition Fountain Pen, an incredible example of Taccia�s expertise in precious metalwork and traditional Maki-e lacquering. The Emperor Maki-e is crafted using the traditional Japanese technique of Nashiji Togidashi Maki-e. Gold powder is precisely dusted onto the raw ebonite body, sealed with coats of hand-brushed natural Urushi lacquer, and hand-buffed with specially treated charcoal so the gold flakes gleam through the hardened coat. The Emperor body takes many days of intricate and painstaking work to create. Sterling silver bands plated in rhodium are symbolically cast in the form of dragon wings, embracing the cap and end. The heart of the pen is the solid Imperial Jade gemstone set into the sterling silver band. Each Jade piece is unique and hand-cut, and comes with a certificate of authenticity. No two are alike! The Taccia Emperor Maki-e fountain pen holds a beautiful rhodium-plated, 18kt gold medium nib and is limited to 90 fountain pens and 30 rollerballs worldwide. Fresh on the heels of the highly successful Hidden Treasures LE�, TACCIA introduces its second limited collection�the TACCIA Snowy Dreams LE�. Combining three delicate maki-e techniques, Taccia's artist has again pieced together one of the most beautiful pens ever created. Using eggshell inlay, hand-laid Raden abalone, and hand-dusted bokashi-maki abalone sprinkles, and sealed in natural urushi lacquer, the TACCIA Snowy Dreams LE� paints a mesmerizing canvas of snowflakes and stars on a captivating Aurora Borealis backdrop. Matte ebonite barrels and a fitted 18-karat gold nib complete the Snowy Dreams LE�, and its compact fluid design suits the pen perfectly for hand and collection. The TACCIA Snowy Dreams LE� will surely be treasured for generations.The TACCIA Snowy Dreams LE� is available in a limited, numbered run of 65 pens�50 fountain pens and 15 rollerballs. The fountain pen is cartridge/converter fill.